Mukesh Sharma: The Life of Sikkim and Kalimpong Sevoke-Gangtok (NH-31A) now formally known as National Highway (NH-10) is finally taken over by PWD West Bengal . The stretch from Coronation Bridge to Rangpo (W.B) which connects Gangtok and Sikkim with rest of the country is very important for Sikkim and Kalimpong. It is also important from tourism point of view as it links favorite tourist destinations like Gangtok, Changu lake, Nathula Pass, Rumtek monastery and others. 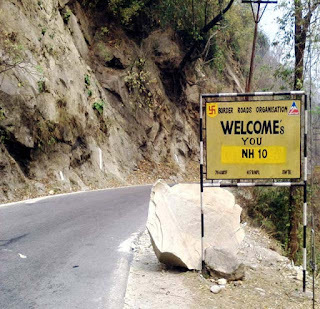 The Life of Sikkim and Kalimpong Sevoke-Gangtok (NH-31A) now formally known as National Highway (NH-10) is finally taken over by PWD West Bengal .